I have always been a fan of pomegranates and pomegranate juice, but a few weeks ago POM Wonderful was kind enough to send me samples of their brand of Pomegranate Juice. POM Wonderful is 100% authentic pomegranate juice and their pomegranates are grown in California. It boasts many health benefits and is packed with polyphenol antioxidants! It is naturally gluten free too! 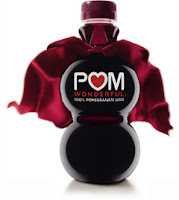 POM Wonderful Pomegranate Juice is available throughout the United States and Canada. For more information, please visit their website at www.pomwonderful.com.